How the Year of the Pig affects you! Click to jump straight to how the Year of the Pig affects you in 2007! Welcome to the Chinese year of the Pig. Chinese New Year is the main holiday of the year for more than one quarter of the world's population and the Chinese New Year commences each year in February, according to our Western, Gregorian calendar. Chinese tradition employs both a Solar and Lunar calendar. 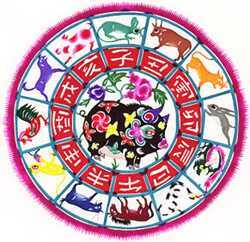 Using the Solar calendar, the year starts on 4th February and this begins the new Zodiac animal cycle. The New Moon day of Sunday 18th February 2007, however, is the official Lunar New Year celebration day when the dragons and fireworks come out onto the streets! 2006 was the Year of the Fire Dog and it's been a fascinating and dramatic year. If I look back on what I wrote before the Dog Year, I find that the predictions of dramatic changes in attitudes to the environment and Mother Earth have all been borne out. Suddenly the media and politicians know the full extent of the coming effects of global warming and changing solar radiation cycles on our world climate, at last catching up to the rest of us. Now in the cycle of twelve animals comes the friendly Pig. The Pig in Chinese astrology has its principal qualities of honesty, tolerance and rigour. The Pig is well-meaning and generous, persevering and steady, and is appreciated for his courage, prosperity and nobility. His best roles are as doctor, mediator, judge, confessor, poet, painter or benefactor. He comes into the world with a lot of very old fashioned sentiments such as goodness, tolerance and an admirable belief in the perfectibility of mankind. Needless to say, the nasties will pounce on him to make mincemeat out of him. Pigs can be very naive, credulous and overconfident, and sometimes even downright stupid. Money – you'd think after talking to the Pig that it means nothing to him – that he can take it or leave it. But, in fact, the Pig finds it really essential to have money and will spend a thousand dollars in a day if he finds what he enjoys. Then at other times he will frugally save every penny in his piggy bank. Happily, Pigs are very lucky with money and it always comes to them somehow. They end their days being well-off and contented. They love domestic comfort and are also in love with nature – their idea of heaven is to take long walks in the forest; their ideal house is in the country, the mountains or at the seaside where they can do regular walks on the beach. A very large number of Pigs usually live in the country and if they don't, they yearn for it every day. Pigs need space and lots of fresh air. Modern flats and apartments will depress them and they will feel sick in a confined space. Lifts and elevators are too much for them for very long. Their home is a pride and joy and they can be found tinkering, renovating, adding to the rooms and frequently decorating to make it all comfortable, filling the place with very expensive and lush objects of beauty. They will not allow dust and dirt to besmudge their property but will remove it in an instant whirl of cleanliness. The mythological stories of the Pig are fascinating, as the Pig is always associated with knowing the next world. Pigs were wild in old China and Vietnam; they were powerful solitary animals that fed on acorns and corn and often devastated the harvests of farmers. In Celtic mythology, the pig was a supernatural animal and the herd of swine was regarded with the utmost respect. The Celts regarded the pig as an assistant in understanding the spiritual nature of man. In many other mythologies too the Pig is regarded as an animal of spiritual authority. The Pig even has a shaman-like quality to him as there are old stories of him changing into human form. In our western culture, however, we have huge problems with the Pig and often find him revolting, or regard him with gastronomical delight and serve him up on platter, knowing little about his symbolism in older cultures. The other image we have is of the pig wallowing in mud – we imagine him as a lewd or indulgent and repulsive beast. Nothing could be further from the truth about Pig. He is a strong and significant animal of spiritual guidance. Pigs love life and even know how to make flowers grow in the desert. They have great imaginations for beauty and therefore make joyful poets and word people. They are fascinated by love and even from their early days are motivated and conditioned around the pleasures of loving others. They can be quite sensual, passionate and imaginative. They like to experiment in love and if you are with a Pig partner, expect to be adaptable in your love life. Pigs are also very faithful by nature and are quite demanding and discriminating. Once they have found the person they love, they are with him/her forever. Pigs expect their partners to be honest and fully express their feelings, like the Pig does. When happy with a relationship, they are very reliable, peaceful and dependent. The Pig is naturally an overprotective parent who is very concerned with the well-being of his offspring – a stickler for education and the right values. He instills the children with a strong sense of morality. The negative side is that he can find it really hard to allow the children to leave the nest and cut that cord – Pigs can be just too possessive. At home the Pig, when he finds a pleasant environment, will rarely move about. This is because he always enjoys a congenial physical environment where he can relax and luxuriate in the best conditions. He finds divorce a bit shocking because it breaks up the harmony and comfort of the home. Each year, the elemental influence of the year changes, and this year we will experience a combination of Fire and Water. There are Five elements in the Chinese system: Wood, Fire, Earth, Metal and Water, with each successive element supporting the next. Across the five, however, they clash and Fire and Water do not sit well together. This year the element is Yin Fire, which is more powerful than Yang Fire. Yin Fire symbolises emotions, tension, agitation and illusions. Underneath is Yin Water. Resulting from this combination will be many conflicts over politics, government and also authorities imposing their will onto the people. Yin Fire is also very explosive and symbolises firearms. The AK47 assault rifle, a deadly weapon, was designed and began production in 1947, the last Fire Pig year. 2007 is a mixed one with the year being ruled by the Fire element in Chinese and the Pig being ruled by Water element. With Fire and Water together it's going to be a struggle, as one is inimically the enemy of the other. Fire is on top this year with Water below – and Fire cannot burn without support. When Fire and Water clash, they either result in lots of scalding hot steam and explosions or they can transform whatever situation it was into something completely different. Previous Fire Pig years have been very dangerous, with much political to-ing and fro-ing, plus lots of upheavals. Other Fire Pig years were 1947 and 1887. In 1947 the separation of India and Pakistan took place and, although it was negotiated well, the two countries tried to move 4 million Hindus and Muslims between borders. By the end of the year, the two were at war. Palestine was partitioned after a British plan to divide Palestine was rejected by the UN. Britain recorded its most severe winter since 1894 and a fierce blizzard hit New York, where 28 inches (72 cms) of snow were recorded. It was the year of the first plane to fly at supersonic speeds (above the speed of sound) and Bell Laboratories invented the transistor, which revolutionised radio and electronics. The CIA was established in the US (Water rules secrets) and, also that year, President Truman released his Truman doctrine, which was an attempt to slow down the spread of communism throughout the world. It was the birth year of the Cold War. At the same time in Burma, the national leader Aung San (father of today's Aung San Suu Kyi, under house arrest) was assassinated. The other most interesting event of 1947 was the report of a crashed UFO near Roswell, New Mexico in the USA. Although several flying saucer crashes were reported in the literature around that time, the Roswell crash is the one that has dominated UFO research and been the most publicised. The place of extraterrestrial races in the Five Elements system is ruled by the Fire element and the issues of UFO contact with humans on earth has resulted in UFOs becoming classified information and subject to great secrecy. Secrets are ruled by the Water element. The resultant clash has been a point of dispute with many citizens' groups ever since the 1960s. We can expect that in 2007 this issue may surface again very strongly and the resultant publicity may allow some secrets to be revealed about UFO sightings in the past. With Fire (ideals) and Water (secrets) prominent in the 2007 chart we can expect clashes of values over secrecy. It's possible some great announcement may be made by authorities in 2007, not necessarily to do with Roswell, but perhaps to do with the possibility of ET life in our solar system (or elsewhere) being acknowledged this year. Other secrets may also be revealed in politics or about our ancient past history this year. The economy in a Fire Pig year can be very driven, as the Yin Fire aspect starts off the year well. Seasonally, when the Spring and Summer months begin (which is from March/April onwards in the Chinese calendar) then the economies of many countries will perform well. These months are favoured by the Fire element. After the summer finishes and the second half of the year comes, the Water element in the Pig year is more favoured: the Fire dies off, so the economy and stock market may slow right down in that second half. In 1997 which was also a Yin Fire year, the Asian markets collapsed in the second half of that year. Looking at industries – those related to Fire and Water will not do so well this year with Water and Fire elements clashing. Water types of industries include communications, media, advertising, shipping, and the water bottling and soft drinks industry. The Fire industries are the stock market, finances, energy generation, electricity, technology, and entertainment. Fire and Water can contribute to sudden breakthroughs though, in technology or new energy devices, and there is great potential for new and dramatic inventions that revolutionise the way we generate power and also solve medical problems. Fire and Water clashing says a lot about climate and weather and you can bet that the year 2007 will be one of even more unnatural climate extremes. Expect dramatic weather changes, storms, fires, droughts, volcanic eruptions, floods and even tsunamis. Other events that could be characteristic of 2007 will be chemical fires, industrial explosions and incidents related to factories or chemicals mixed in the wrong manner causing toxic poisoning and maybe even in food poisoning outbreaks. The Fire Pig year will also be a year of drama and change in politics, as the Fire/Water combination means clashes of values and criticism, unrest, threatened coups or violence in politics and arguments, disputes and fights over values and rights. Those who tackle political issues in a violent, combative or aggressive mode will not do well this year, but those who take on issues with a more sympathetic and embracing approach, using mediation techniques, are far more likely to achieve success in a Pig year. There could be sudden changes in leadership, many arguments in politics and dramatic rebellions of peoples fed up with oppressive rulers. Keep all that in mind in your business, family, education areas and daily life – you'll be more successful. Carl Yung, influential analytic psychologist, populariser of the "Collective Unconscious"
and Albert Schweitzer the humanitarian reformer. Click here to read how the Year of the Fire Pig affects you!